The jurisprudence of [religious] tolerance as an individual liberty originated first in the New World on Governors Island - NY State's birthplace in 1624 and its most historic landmark. The Tolerance Park Foundation seeks to safeguard the Island's national symbolism and vital message of tolerance as a reciprocal dynamic in the conception of American freedom through broad awareness via a sustainable development. 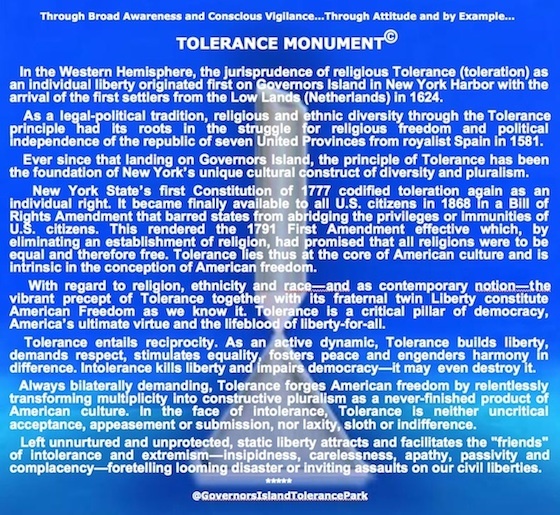 A Tolerance Park with a Tolerance Monument as centerpiece exemplifies this universal value as the foundational principle for liberty that lies at the root of America as a secular, democratic republic wherein all religions, ethnicities and races are "equal" and therefore free. Thus revealing the Island's unique facet of history and relevance in tomorrow, three NY Harbor islands will compose a tableau of America's interdependent, elemental values - Tolerance (Governors Island), Liberty (Liberty Island) and Welcome (Ellis Island) - in an omnipresent National Heritage Triangle. The appropriated image of Broken-Obelisk by Barnett Newman venerating Martin Luther King Jr.
(1) Tolerance is to be alert and respectful of all fragments of the living mosaic that composes the human tableau thus sustaining its overall splendor: See third-party video "STAND BY ME" as reflective of harmony in difference. (2) The North-American locus of the universal value of tolerance as a condition to liberty is Governors Island: See video ISLAND TRIAD OF PRIMARY AMERICAN SYMBOLS. (3) Tolerance is pivotal in the concept of freedom-for-all and transcends cultural/national borders. See third-party video "WE ARE THE WORLD" as reflective of synchronized humanity toward helping restore the living mosaic we compose. The twin concepts of Tolerance and Liberty define the juridical and cultural construct to which American Freedom refers and on which successful pluralism depends. An island triad of America's primary values in NY Harbor ― the Governors Island Tolerance Monument as the universal embodiment of the vibrant force of Tolerance in the conception of American Freedom, the Statue of Liberty on Liberty Island and the American Immigration Museum on Ellis Island ― composes a National Heritage Triangle of uniquely historic islands as National Symbols and as visual sentinels of American Freedom and beacons to humanity. (a) Culturally, the reciprocal dynamic of Tolerance ― America's fundamental freedom principle ― fosters freedom-for-all in the United States of America through shared awareness, joint understanding and mutual respect. As a Common Theme, it transforms diversity ― merely an observed, static fact ― into a vigorously formed, flourishing societal tableau. Liberty is therefore the cultural product of the jurisprudence of Tolerance whereas Tolerance is Liberty's antecedent. They are the fraternal twins in the notion of American Freedom. (b) Constitutionally, this freedom-for-all is protected in the Bill of Rights which abolishes and rejects the concepts of a privileged, preferred or superior religion, ethnicity and race. Thus accepting diversity of religion and race unconditionally, it guarantees that all religions, ethnicities and races are "equal and free." Following a shooting at the U.S. Holocaust Memorial Museum in Washington, DC on June 10, 2009, President Barack H. Obama said: "This outrageous act reminds us that we must remain vigilant against anti-Semitism and prejudice in all its forms." What and Where is Religious and/or Racial Freedom? The precept of Tolerance is a reciprocal dynamic (that is, a two-way street.) The notion of Tolerance being selective, therefore, is incongruous. Tolerance as a moral force in the understanding of [American] freedom is a pro-active process. It transforms peaceably pre-modern values, attitudes and beliefs held in certain societal segments to modern Western values, norms and customs. ● As a dynamic notion in the conception of [American] freedom, Tolerance engenders debate about ever-present differences in cultural norms and values. ● As a state of mind, Tolerance is about reciprocity, mutual understanding, respect and full acceptance. In an intolerant society Liberty as a static notion is meaningless. Only through broad awareness and conscious vigilance can liberty be sustained. The credos of Tolerance and Liberty ― fraternal twins ― thus constitute the conception of American Freedom. Tolerance is the realization that postmodern humanity is determined by crucial themes of normative differences (tolerances) as standard deviation from the mean ― freedom. All other politicians of the State and City Legislatures, the U.S. Congress - including New York's Congressional Delegation - as well as the chief officials of the Executive Branches of the United States, New York State and New York City still need to approve the above message thus acknowledging New York's birthright and its universal theme of morality that accepts the full humanity of others and which lies at the root of the United States of America as a secular democratic republic wherein all religions, ethnicities and races are "equal and free," however subjected to civil law and policy. In the New World, religious and ethnic pluralism through Tolerance as a legal-political condition were placed first on Governors Island in NY Harbor in 1624. As iconic National Symbol of America's ultimate virtue of Tolerance and common theme for social cohesion, a proposed 151 feet high Tolerance Monument will be anchored to a 50-acre Tolerance Park on 30% of Governors Island. They will restore the Island to its historical, thematic integrity and imbue it with its original message and historic symbolism. This Government Island park-to-tolerance will emanate lasting loyalty to America's earliest value - the elemental precept of Tolerance as a subset of American Freedom and as primary pillar of American culture and democracy. The historical meaning of Governors Island lies in its existence as unrecognized Conceptual Art since 1624 when the jurisprudence of Religious Tolerance as the basis for ethnic diversity was delivered onto it. Its transformation to Visual Art and National Symbol is to be accomplished by way of the envisaged living Tolerance Park with the Tolerance Monument as centerpiece. It will be the New World and the nation's first park that addresses issues of dynamic Tolerance as they define American Freedom thus upholding constitutionally protected personal freedom (= Liberty) visually and intellectually. In the way that New York City's Museum of Modern Art (MoMA) is housed in a mixed-use skyscraper wherein about 20% is dedicated to exhibition space and 80% to residential use, the Tolerance Park will similarly be dedicated to exhibition space devoted to interactive educational exhibits about religious, ethnic and racial Tolerance. The remaining structures of the Tolerance Park structures will serve as America's first mixed-use urban artist colony that focuses on arts and crafts with emphasis on vanishing arts and crafts disciplines from before the 19th-century. The envisaged Tolerance Monument of global meaning, thematic substance and 21st-century visual greatness will be portrayed by appropriating two ancient Egyptian images that had been joined by the American artist Barnett Newman into a unified sculpture named Broken-Obelisk (a copy of which is in MoMA.) It was dedicated to the memory of Dr. Martin Luther King Jr. after his assassination in 1968. The implicit MLK monument serves thus as a tribute to Martin Luther King Jr. Relating the Tolerance Monument's necessary depiction of harmony-in-difference or cohesiveness - central to the precept of tolerance as a common, unifying theme - to the likeness of Barnett Newman's fusion of disparate icons will integrate Broken-Obelisk's history, meaning and cultural value into a constructive national symbol of eternal consciousness. By using contemporary technology, materials and engineering, the image of Barnett Newman's incongruent union can be extrapolated to a height of 151 feet (46 meters). This height equates that of the Statue of Liberty's without pedestal (that is, half the total Liberty Monument's height because Broken-Obelisk stands on the ground) because Tolerance and Liberty are equal partners or the fraternal twins in the understanding of American Freedom. This new emblematic beacon, akin to the iconic power of Stonehenge, will be an implicit tribute and testimonial to racial Tolerance by recognizing the fact that, for the African-American segment of the population, Liberty was a concept from which they were largely excluded legally and culturally. Raising awareness of Tolerance from which [American] Liberty germinates will extend the boundaries of Liberty for all mankind thus. The image of the Barnett Newman sculpture - implicitly venerating Martin Luther King Jr. - upon its transformation into the Tolerance Monument will comprise a Tolerance Hall to address issues of human servitude in modernity while placing special emphasis on the portrayal of this topic in the Atlantic arena from the 15th through 17th centuries. The contemporary relevance of such an exhibit may best be underscored by the fact that, today, there are more chattel slaves in the world than ever before: between 12 to 27 million. This is in spite of the United Nations' 1948 Universal Declaration of Human Rights, in Article 4, that "No one shall be held in slavery or servitude; slavery and the slave trade shall be prohibited in all their forms." It will highlight uplifting exhibits and narratives of Herculean courage as inspirational demonstrations of humanity's capacity for astonishing compassion that emerges from the depths of depravity and indifference. The color of the pyramid section will be black to reflect its theme: "Black has an innersound of nothingness bereft of possibilities, a dead nothingness as if the sun had become extinct" so wrote Kadinsky. Because black's cognate is blue, the upside-down obelisk section will be translucent to radiate blue light as a blue-sky tribute to mankind's power to rise and create ex nihilo. It will be situated on the same spot within the Tolerance Park as where Fort Amsterdam as Capitol was positioned within New Amsterdam, now New York City. Just as when Governors Island became the region's first crossroad of three cultures in 1613 when Jan Rodrigues from Santo Domingo and of African and European ancestry summered there, the Tolerance Park, when it opens in September 2009, will become a meeting point for the cultures of the world to debate on these issues of profound importance to future generations. The Tolerance Park will be of architectural uniqueness and cohesiveness and therefore reflective of harmony-in-difference - the ideal condition of the virtue of Tolerance. It will be a place where 350 years of contrasts will visually dissolve harmoniously into a new and unique village, just as divergences and boundaries melt away through the ethical force of Tolerance into common humanity. Consequently, the Tolerance Park will link visually the 1624 historic planting of [Religious] Tolerance (that is, the "father" of American Liberty and the basis of successful pluralism) on Governors Island with broad 21st-century awareness of that dynamic ethical force as being indispensable to religious, ethnic and racial Liberty in contemporary American society. The French gift of the Statue of Liberty (inaugurated in 1886) transformed Bedloe Island to Liberty Island in 1956 to become an omnipresent, fundamental American symbol. Similarly, our proposed 50-acre canvas for the creation of a masterpiece of thematic and visual excellence―the Tolerance Park wherein situated the Tolerance Monument as centerpiece―will transform Governors Island, over time, to Tolerance Island. The envisaged canvas for profound creativity will explicitly acknowledge constructive pluralism-through-tolerance as an original, historic, indispensable dynamic notion in American freedom since 1624―the year in which it took root on the very place where it was planted first on Governors Island in the Western Hemisphere. The 50 acres for the work of art―legislatively set aside for that purpose―will generate the third iconic island symbol as a quintessential, fundamental American symbol in New York harbor. Governors Island, the nation’s oldest natural, historic, primary symbol since 1624, precedes the later created island symbols (“Liberty” by way of the Statue of Liberty and “Welcome” by way of the American Immigration Museum) in historical priority and national meaning. These three symbols happen to be ideal complements and are fully interdependent with respect to a more insightful understanding of what constitutes American freedom. Each island embodies a unique facet of its own history that is inherent to the way we experience personal freedom. Geographically perfectly aligned in a triangle, the island triad thus composes a new, timeless American icon: The National Heritage Triangle. It will provide our children with an opportunity to understand the twin notions of tolerance and liberty of American freedom and imbue them with a deeper appreciation of the meaning of freedom in a pluralist society through broad awareness and conscious vigilance. The envisaged park will therefore protect the nation’s ideal and tradition of tolerance and uphold America’s ultimate, active virtue to the world while preserving the national significance of Governors Island's historic symbolism as an enduring beacon to humanity. The jurisprudence of religious tolerance as an individual right was introduced first in the Western Hemisphere as a legal-political and cultural tradition in 1624. In that year, the precept of Toleration was placed on Governors Island in New York Harbor with the landing of the first settlers to the New York Tri-State region. This legal notion is the foundation of New York's unique characteristic of cultural diversity and pluralism, and New York State's juridic patrimony. This Tolerance of the year 1624 had its roots in the independence of the Dutch Republic from Spain in 1581. It was re-introduced as a legal-political and individual right in New York's first State Constitution of 1777 and codified in 1791 as an amendment to the U.S. Constitution in the Bill of Rights after the formation of the republic of thirteen United States in 1776. (1) As an ethical force, Tolerance lies thus at the core of American culture and is America's ultimate virtue. (2) As a prerequisite to sustainable liberty, the limits of tolerance also set the standards of liberty and societal freedom itself. (3) With regard to religion, ethnicity and race, the partners Tolerance and Liberty constitute the conception of American freedom. Hence, the vibrant notion of Tolerance is a subset of American freedom as well as a crucial pillar of a secular democratic republic--the United States of America. Tolerance is the lifeblood of American liberty as we know it. (4) As an active dynamic, Tolerance entails reciprocity and reciprocal respect. Always bilaterally demanding, it forges Western/American freedom by relentlessly transforming plurality into constructive pluralism as a never-finished product of Western culture. (5) Globally, Tolerance is pivotal in the concept of freedom-for-all (i.e., liberty) by transcending cultural/national borders in order for humanity to function. (6) In the face of Intolerance, Tolerance is neither uncritical acceptance, appeasement or submission, nor laxity, sloth or indifference. Left unnurtured and unprotected, simple liberty invites and facilitates the "friends" of intolerance and extremism---complacency, carelessness, apathy, passivity and insipidness--opening the door to insidious assaults on civil liberties. (7) Tolerance builds liberty. Intolerance kills liberty. It impairs democracy and may even destroy it. (8) Tolerance is not about promoting religion, ethnicity or race or, for that matter, anything else that involves the pursuit of one's self-interest. Nor is it about advancing the individual pieces of the living mosaic at the expense of other fragments that compose the American tableau. (9) Tolerance is the cement that holds the individual pieces of the living mosaic together for it to be seen in its fullest glory. It is about being alert and respectful of all its segments. Only then can its overall beauty be sustained for the enjoyment of those willing to see it--for the common good and in the public interest. (10) The locus of this quintessential American precept as a condition to liberty is Governors Island--New York State's official birthplace. When set aside for the visualization of this timeless message by the New York State Legislature, the Island will instill confidence in the dependable and binding power of tolerance and conciliation as indispensable to the concept of American freedom. "In [certain] Islamic countries...cruelty is implacable and inequality is the law of the land. Dissidents are tortured. Women are policed both by the state and their families to whom the state gives the power to rule their lives. In the West, individuals enjoy rights and freedoms that are recognized and protected by the state. To accept subordination and abuse because Allah willed it - that, for me, would be self-hatred. This mindset [of intolerance] makes the transition to modernity very painful for all who practice Islam. We in the West would be wrong [by accepting intolerance through appeasement and indolence] to prolong the pain of that transition unnecessarily by elevating cultures full of bigotry and hatred toward women to the stature of respectable alternative ways of life. The freedom of expression that I found in Holland - the freedom to think - is unknown where I come from." Editor's comment: The Tolerance Monument neither targets, blames or condemns nor advances any religion, ethnicity, race or nationality. Religion, religious culture or ethnic traditions are not synonymous. If religious interpretation is a problem rather than faith itself, then, religious identity or its derived culture or practices, if stagnant, can evolve and be transitioned to modernity. This process is accelerated through freedom of expression. The American culture of liberty-for-all, based on secular civil law, supersedes the strictures of individual religions or religious and ethnic identity. Tolerance is about vigorous debate (two-way) because it is a dynamic precept which defines the limits of liberty-for-all and identifies where intolerance starts and liberty-for-all ends. It thus sets the [never-static] standard of freedom through eternal consciousness and "The principle of freedom of expression...."
"To be conscious that you aren't the only person in the world. When I think about this concept, words like patience, respect, equality, differences, will, knowledge, education, and culture come to my mind. I think that they are all in the concept Tolerance; they are all indispensable. Sometimes, people believe that their ideas, customs, behaviors and education are correct and think that all the other people must be equal to them. Sometimes, we believe that we are right. We haven't learned yet to respect the differences between the humans. Modernity directs us to globalization, and I think that that makes us less tolerant. Globalization means to make universal the ideas, customs, behaviors, political and economic model, but in this case the concept equality abolishes cultural differences, the right to think according to your customs, and the right to practice your culture. When I think about that, I remember an important man of México called Benito Juárez, who one time said: "El respeto al derecho ajeno es la paz " something like: "The respect to the right of the other people is the peace." I think that this just explains what Tolerance means. If we want our world to be better, we must be tolerant in our relationships between persons, countries and cultures; we must know our differences and accept them with respect and always remember that my freedom finishes where your rights begin. • Liberty however - the Statue of Liberty is Liberty's historically imperfect symbol - can't flourish or endure in an intolerant society. That's why the notion of liberty-for-all derives from the precept of Tolerance as a reciprocal dynamic and fundamental value in the conception of American freedom. Liberty is thus Tolerance's accompaniment on which it is grafted. By eliminating the [political] concept of a privileged, preferred or superior religion, ethnicity or race, the American Constitution accentuates that all these groups and its members are "equal and free" under civil law. In the Western Hemisphere, the jurisprudence of toleration (religious tolerance) as an individual liberty was placed first on Governors Island in New York Harbor in 1624. This judicial notion is the foundation of New York's unique characteristic of diversity and successful pluralism since 1624. It was recodified in New York State's first constitution of 1777 and, 91 years later, became an individual right in all of the United States of America through the 14th Amendment in the Bill of Rights - New York State's juridic patrimony. "Most of our opinions are based on a dearth of knowledge and lack of understanding."